I have read three of the above books (5, 7 and 8) and can say they place on the list for good reason. It’s a safe bet that the others have equal “top 10” merit. After all, if the entire list is the same quality as Searching for God Knows What, anyone who has been reading this blog knows it would be a life-changing summer if someone read the whole list. Do you think there are books missing from this list? What other books should a Christian read over the summer? I mean besides the obvious one too great to even compare with others. Seriously, comment with your favorite Christian reads. And while you’re commenting anyway, maybe you can answer a question that came up with a couple friends this weekend. They were wondering who the contemporary, big-name Christian authors are. Those authors whose books become fodder for church small groups and they get invited to speak at every Christian conference in the nation? Who are those authors who everyone seems to talk about? Let’s start a list. You know that feeling you get that can only be described as conviction? You might swear all day and even when you’re sleeping, but one Sunday you hear a powerful sermon about the evils of the tongue. This feeling sparks in you and makes you fidget in your seat. The uncomfortable feeling takes root, digging into your mind, until it changes into a nagging doubt. It tells you maybe cussing at coworkers is worse than you thought before, maybe your use of language damages how other people see Christians and, by extension, Jesus. You start to wonder if you should cut out swearing altogether. God has convicted me to read the Bible daily. That small, still voice whispered every time I picked up one of my books that I am missing out on something greater in my spiritual life by not choosing The Book. Doesn’t God’s Word deserve the top spot on my reading list? At the beginning of the summer, Olive Tree Bible Software (where I work) released the Olive Tree Summer Bible Reading Plan. The e-book gives readers a guided tour of the Bible, from Genesis to Revelation, along with short introductions to each genre collection and book. The people who came up with the idea for a summer reading plan invited me to help pull it together in time for the release date. Besides joining the collaborative editing process, I wrote the introductions for the genres of Books of Wisdom/Poetry and Gospels/Acts, as well as introductions for all the books those genres include. Why am I telling you this now and not on June 1 when it released? Well, when we finished the work, I plugged it all over my social networks and to the certain friends I thought would be interested. I downloaded it myself and fully intended to support the project by following the plan for the summer. The download was free back then, and I had the time for a little daily reading. As you can probably predict, other summer plans soon distracted me from the Summer Bible Reading Plan. My previous reading commitment faded from memory, and I turned to books made of paper, not bytes, I had collected beforehand and had yet to finish. Since then, the list of books to pick up has only grown. My summer apartment has a small bookshelf that is quickly running out of shelving space, even with most of my book collection still at my parent’s house. Last week, a friend let me borrow two more books by C. S. Lewis, The Great Divorce and God in the Dock, which are waiting on the bookshelf. I’m trying to keep up by reading all at once Jesus Calling by Sarah Young, Too Busy Not to Pray by Bill Hybels, and 19 Gifts of the Spirit by Leslie B. Flynn. Another book joined the list Tuesday, given priority for professional improvement, when The Chicago Manual of Style 16th Edition came in the mail. But there’s something still missing from my daily reading. I’ve recently started to notice how everything I read tells me reading the Bible itself is beneficial and good, necessary even. I find little reminders in the verses at the end of each Jesus Calling devotional, Bill Hybels’ frequent examples of prayer in Scripture, and how spiritual gifts are apparently rooted in regular devotion to the Word. Besides Chicago, my book list reduces down to reading about the Bible, yet most of my time in the Bible only comes through my work for Olive Tree. I decided to start with Psalms, which I’ve wanted for over a year to read straight through. Somehow, it never happened. I started this Monday, and in five days, I’ve already covered 78 psalms. Psalms lasts 120 pages in my Bible. I only have 58 pages to go, just short of half. Not too hard for the longest book of the Bible, right? The best part: Psalms is one of my favorite biblical books. I prefer to read Psalms aloud, enjoying it not only as part of the Bible, but as a collection of ancient Hebrew poetry. Each psalm is written as a song or prayer addressed directly to the Lord. The themes of praise, thankfulness, sorrow, celebration and trust connect with every human emotion and experience in relationship with God. Whatever your situation in life, there’s a psalm that tells in beautiful poetry what you are feeling and God’s loving care over you. But now that I’m halfway done with Psalms, I don’t know what to read next. Suggestions are welcome. What are your favorite books in the Bible? Tell me what part of the Bible I should read, and if you’re looking for a Christian book outside of the Bible, a summer reading list is coming your way in my next post. Let’s help each other. Donald Miller makes a confession here in the second to last chapter of Searching for God Knows What. He doesn’t claim to be right. He instead admits, “As for me, I’m somebody who repeats what I was taught in Sunday school using fancier language.” Isn’t that shocking? We’ve read almost his whole book and only now does Miller tell us that he stole the main ideas behind everything he writes. But wait, he qualifies the confession with, “And yet it is amazing how I can take these beautiful things Jesus told me, this skeleton of the human story He explains in narrative and poetry, and turn it around as though I wrote it on the back of a napkin at Denny’s in a moment of inspiration.” And that’s why I still enjoyed reading his book. Still, you are never right, according to Miller. Even when you think you are, when you say you might be the slightest bit of right, not even then. He says no one can “be” right, because “right” is only an idea that we label as part of truth. Whether we agree with a “right” idea has nothing to do with our own “rightness.” We can’t claim the credit for an idea that was never ours. Memorizing scripture and winning Bible trivia games don’t make you a better Christian, either, let alone a better shot at a ticket to heaven. Thinking we know all the right answers has a strange effect that fills us up with air until other people become the ants we’ve risen above. If you’re wondering about the biblical basis there, try Galatians 6:3 and James 1:26 for starters. God tells us our artificial trophy religion and all our hoarded knowledge do nothing for us in the end. Far from being medals of pride and honor, they mean nothing unless we know Jesus Christ and he knows us. The Church has received some well-deserved criticism in recent decades. Many Christians, if not all of us, are outright hypocrites. Miller recognizes that we desperately try to prove our value, and ultimately Christianity’s, to the world. We want to show we are right and can still be cool. Yet, for all her mistakes and blunders, Miller rejects the argument that the Church has to go. Religion has its failings and has caused severe harm in some cases, but then it is also beautiful when used to connect with Christ and spread his love to all people. Shakespeare’s classic tale relates allegorically the greatest love story, that of Christians and Christ. To show the relationship between the Church and Christ, Miller applies the example of Romeo and Juliet. Sounds strange, doesn’t it? 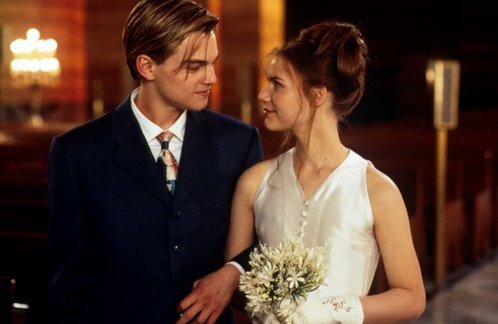 The connection has surprising foundations in the famous balcony scene when Romeo comes to see Juliet at her home and later when the lovers are finally reunited only after dying. Miller goes so far as to say the poetic lines can match directly to the Calvinist theology of Shakespeare’s time. “In this beautiful way William Shakespeare weaves the intricate complexities of the love relationship between God and the church into the context of narrative,” Miller says. He argues that the best way to explain the gospel is not through formulas and lists, but through a series of stories that communicate the greatest love story. This is just what the Bible does, and which Shakespeare uses in Romeo and Juliet. We can’t simplify our relationship with Jesus to a cold list of things to believe and do. His love frees us from the lifeboat’s ropes. We can forget about accumulating wealth, beauty and status to give ourselves worth. Christ alone redeems us to Himself, our true love, and we will reunite when this life passes away. So what’s my final review? Searching for God Knows What does not disappoint and is a worthy book to follow Miller’s previous bestseller, Blue Like Jazz. Other Christian writers should use Miller as an example if they want to inspire ordinary, lukewarm people to talk about the Bible and get to know Jesus. I’m grateful my sister had the wise inspiration to give me this book for us to discuss together. It certainly can give anyone fortunate to read it much to discuss with anyone they choose, Christians and non-Christians alike. If you’re looking for all the answers to God and life, you’re looking in the wrong place. But if you want something engaging and thought-provoking, prepare yourself to probe deep into what you believe about the greatest love story the world has experienced. Living in the lifeboat means we have to prove our worth to other people. If we don’t , we worry we’ll be thrown into the sea. Miller introduces a new metaphor in the next section of Searching for God Knows What. He compares life instead to working in a circus. 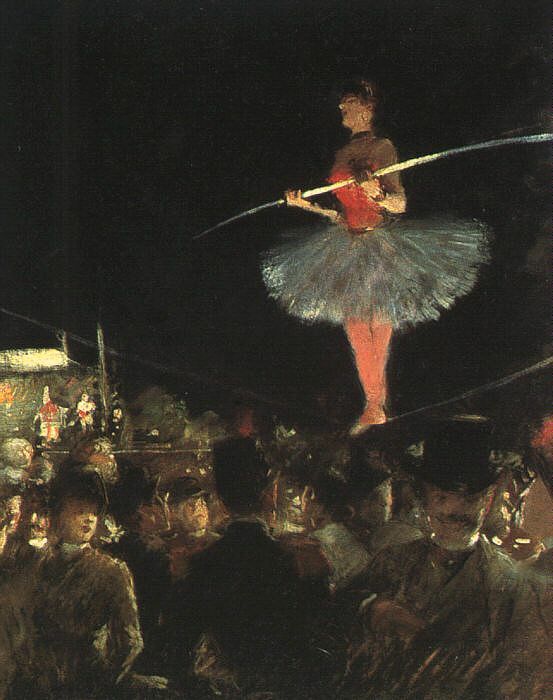 Every circus performer wants the audience to clap for their act and therefore say they have worth in the circus. If they entertain the audience, they keep their jobs. Like performers, we want others to redeem us. We think others can save us if they say we have value. Jesus’ words comfort us because he said we don’t have to perform to be loved. We don’t have to please an audience. We don’t need to act like circus monkeys. Jesus gives us freedom. But even then, we often don’t accept freedom for free. We continue to force ourselves to perform for God and other people. Maybe if we just act good enough, we think, then we can earn redemption and freedom. If we’re good enough, can we give ourselves value by performing to God and others? No, morality cannot redeem us, but we all know some sort of morality must exist. We want it to exist. As much as we idolize rebellion, we actually want rules and guidance. Without them, everything is chaos. Morality can’t free us on its own, but we should follow it all the same. It means imitating God, choosing right over wrong. If you’re a Christian, though, morality is more a relational connection than a list of rules. That’s important to remember. If you do something immoral, you don’t just break a rule. You break your commitment to God, much like cheating on your spouse. It does not just violate the law, but love. This morality is personal and should not be belittled by claiming God’s grace when you disregard it. Loving God and following his morality also means loving the other people he created. Miller brings up the hot button issue in churches of homosexuals and the Moral Right. Having morality does not mean condemning “immoral” people, setting yourself up higher than them. It doesn’t mean a “culture war” between Christians and the rest of America. No, if we’re going to follow Jesus, we have to love God and others above all. Our “war” is against Satan and his power, not the people he has captured and blinded. “Morality, in the context of a relationship with Jesus, becomes the voice of love to a confused community, the voice of reason and calm in a loud argument, the voice of life in a world of walking dead, the voice of Christ in a sea of self-hatred,” Miller says. Miller speaks from one step back, taking in the American chaos of squabbling voices and telling it as he sees it all. He addresses the major issues American churches like to debate, but instead of blaming liberals or homosexuals as some Christians are so fond of doing, he puts up a mirror and asks how we look when we argue about moral rules and judge people not like us. Is this the image of Jesus in the Church? “The person who believes the sum of his morality involves gay marriage and abortion alone, and neglects health care and world trade and the environment and loving his neighbor and feeding the poor is, by definition, a theological liberal, because he takes what he wants from Scripture and ignores the rest,” Miller says. I would like to add that God-centered morality substitutes misplaced pride with proper humility. If we remembered we are nothing outside of Jesus, then perhaps our hypocritical tendencies wouldn’t get in the way of God’s children meeting their Father. Everything we do should point back to God and his unfathomable love. It should all direct our fellow humans to the One who can rescue them from this crumbling world.